The Olive branch, a symbol of peace and creation and is our inspiration to create this impressive artwork. 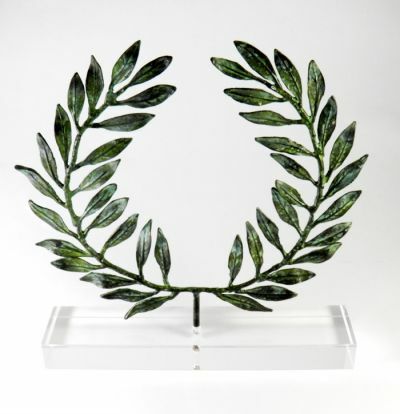 The olive wreath, also known as kotinos, was the prize for the winner at the ancient Olympic Games in Olympia. The design and sculpture is made by the artist El Phil (Eleftherios A. Philippakis). The wreath is made of solid brass with natural green patina (oxidation) and it is mounted on an acrylic base (plexi-glass).